Exercises for losing weight: cardio or interval training? Getting started with the best exercises for losing weight. How does dieting compare to exercises for losing weight? Which exercises for losing weight are the most effective? What is the best way to get started? High intensity interval training is included in many current weight loss programs because it can burn many calories in a short amount of time. Muscle growth is much greater with this type of exercise than less intense exercise. For fat and weight loss, the advantage of having more muscle is that larger muscles will burn more calories all day long, even at rest. Cardiovascular exercises (Cardio), performed at a moderate intensity, had been considered the best and safest way to burn fat and lose weight for many years. The reasoning? It’s easier to exercise at a lower intensity, so beginners can burn extra calories in a long aerobic workout without excessive stress or strain. Research on obesity, fitness, and exercise has compared different exercise programs and their effects on weight loss. Studies have shown that both aerobic exercise and high intensity exercise help with weight loss, though faster improvement was seen in programs that included high intensity exercise. As you might expect, multiple studies found that the more calories you burn per week, the more fat you will lose. Studies show that at least 45 minutes of moderate exercise per day is best both for weight loss and weight maintenance. See references (2-4). For many people, a combination of high and moderate intensity exercise training will work the best both for weight loss and for improving physical fitness. If you are just beginning, lower intensity aerobic exercises like walking or hiking may be an easier and safer starting point. If you are already an active person, you can include high intensity exercise in your training for muscle building and more rapid weight loss. Choose from a variety of exercise programs that include videos and detailed illustrations. The most effective weight loss plans will include exercise and a healthy diet. Find out the best food choices, proven by research. 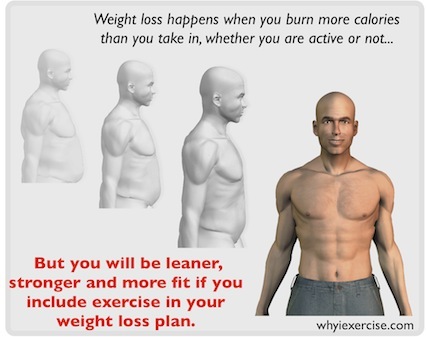 Return from exercises for losing weight to facts about obesity. Return to home page: Why I exercise. Copyright ©2010-2018 whyiexercise.com. All rights reserved.